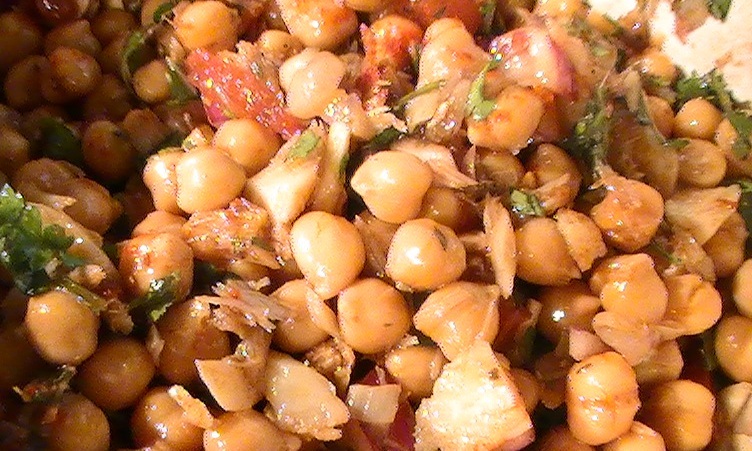 One of my all time favourite salads is my mom’s Chick Pea & cod salad. Just Perfect for hot summer days or nights. It’s easy, fast and really healthy for you. For those that are a category 1 Portuguese food eater, skip the cod and you’ve got a vegetarian version. Either way it’s bursting with satisfying flavour with a dash of new world Portuguese charm ! Enjoy this favourite of mine ! garlic powder & black pepper to taste. 1)After blanching the cod-fish for 24 hours to get rid of the salt, boil the cod for about 10 minutes or so, and let it cool off. 2)After the cod has cooled, flake the white part of the fish, discard the skin. Put to the side. 3)Mix your dressing ingredients and set to the side. 4)Drain the 2 cans of chickpeas into a sieve, wash it thoroughly. In a medium-sized salad bowl, add your chickpeas, garlic, chopped red pepper or chopped tomato, chopped celery, red onion, parsley, cilantro, celery leaves, cummin. 7)Finish it off with a few drops of piri piri and a few pinches of paprika. 8)Mix well. Add some garlic powder or black pepper to taste. And that is it ! 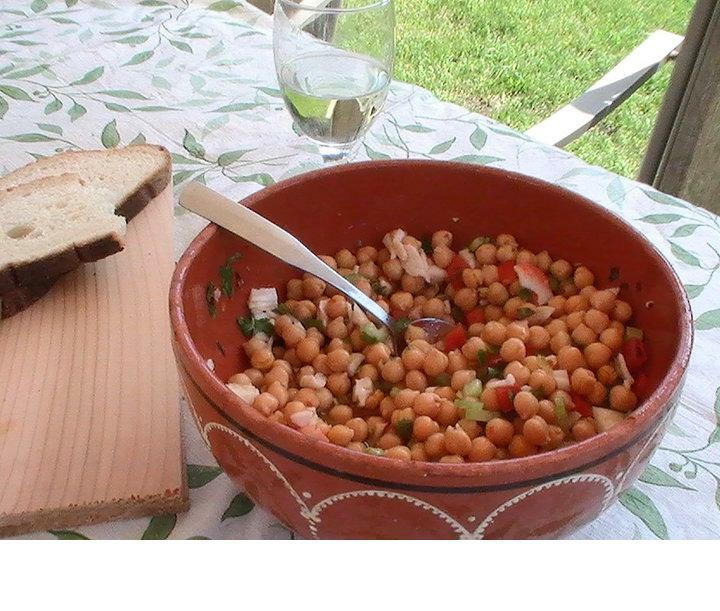 Great easy dinner for those hot summer nights..Hey and don’t forget the hearty bread & a glass of red or white wine !. Looking forward to your comments on this one ! LOVE this salad! Even though must be even better than mine as you add many more ingredients than I do! Ah bless your heart !